Give a hoot — don’t pollute! Woodsy Owl* is an owl icon for the United States Forest Service most famous for the motto “Give a hoot — don’t pollute!” Woodsy’s current motto is “Lend a hand — Care for the Land!” Woodsy’s target audience are children 5 to 8 years old and he was designed to be seen as a mentor to children, providing them with information and advice to help them appreciate nature. 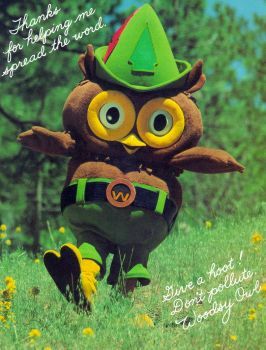 In 2006, a “new” Woodsy Owl mascot was introduced. Harold Bell created the mascot for the first Earth Day in 1970 as part of a forest service campaign to raise awareness of protecting the environment. Woodsy’s slogan was later introduced on September 15, 1971 by Secretary of Agriculture Clifford Hardin. The first Woodsy Owl public service spot was created by US Forest ranger Chuck WIlliams for the Lassie TV show which featured a Forest Service ranger and his family. In 1974, the U.S. Congress passed the Woodsy Owl Act (Public Law 93-318) to protect the image of the character. Several songs have been used in conjunction with the Woodsy Owl environmental campaign, including “The Ballad of Woodsy Owl” and “Help Woodsy Spread the Word”. Several other environmentalism, conservation or outdoor themed comics have appeared over the years including Mark Trail and Smokey Bear. Woodsy Owl appeared as a comic by Gold Key Comics from 1973 to 1976.